The kids enrolled in the summer school mainly come from Angola and the Republic of Congo. In recent years, the ukulele has become increasingly popular for would-be musicians of all ages. And this week 25 new immigrants — who are getting ready to go to school for the first time in the United States — are getting a crash course in the instrument and an introduction to the classroom. It's part of a five-week program offered through the Portland Public Schools. "Row, Row, Row Your Boat" isn't a song most of the kids in this class are familiar with, but they play along as instructor Lee Urban teaches them three different versions of it. 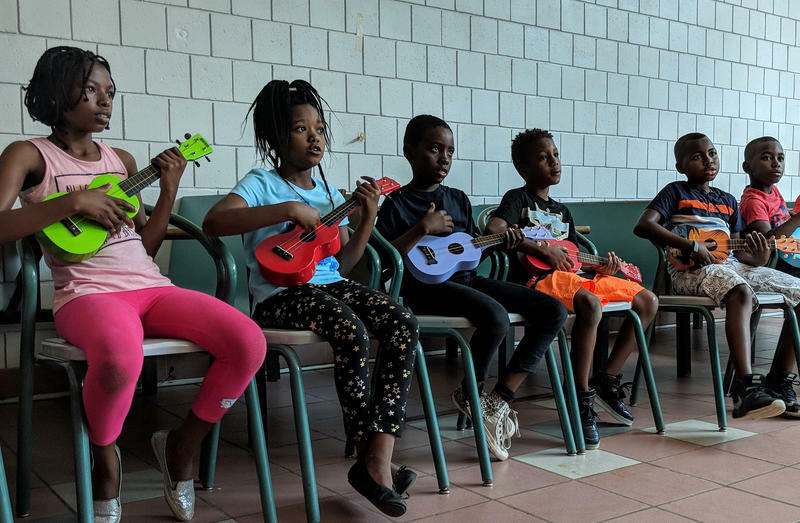 Lee Urban of Ukuleles Heal the World teaches children enrolled in the Family Shelter Summer Program which is offered through Portland Public Schools. The kids in the room range from five- to 10-years-old, and they're all recent arrivals in the United States from Angola and the Democratic Republic of Congo. Most of their families are seeking asylum and living in the city's homeless shelters until they find permanent places to live. “They don't — at this point — don't technically have a home school. So the city is offering summer programming for children from the shelter,” says Carol Ridlon. Ridlon is a teacher with the Portland Public Schools and the coordinator of the Family Shelter Summer Program. She says the kids begin their day with breakfast at the shelter. 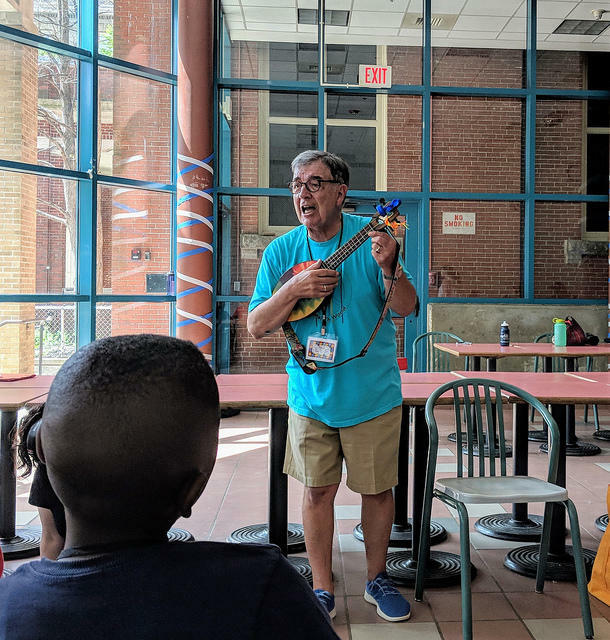 “Then they'll go to their classrooms where they do a morning meeting, and then they begin to do some academics around math and language, and then they'll go to the playground and, once in a while, we'll do some special activity,” she says. 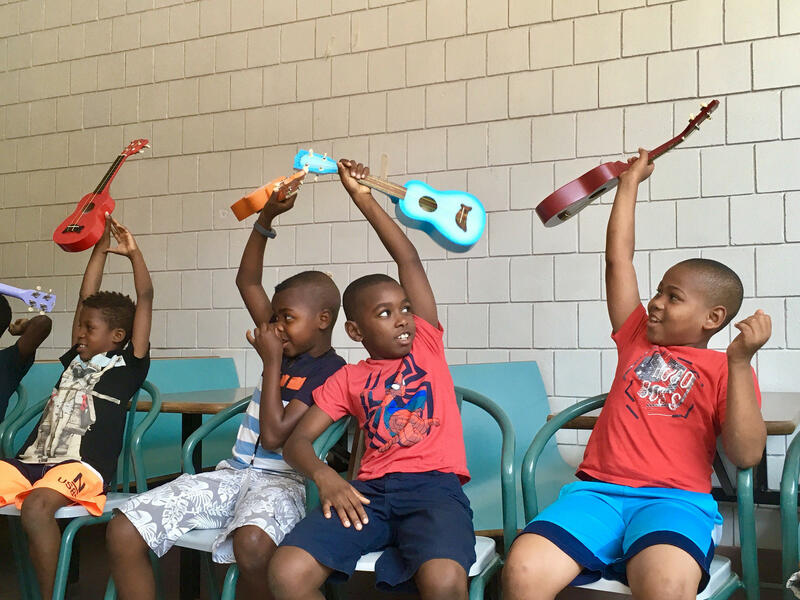 After the lesson, the kids raise their ukuleles in celebration. Ridlon says the schedule is designed help get kids comfortable in what's often a very foreign environment. “It's going to help level the playing field when the kids enter school in the fall,” she says. These kids are so new to the United States, that they don't speak much English, so the entire lesson is translated into French and Portuguese, which are spoken in their home countries. So far this summer, the kids have gone to the Maine Wildlife Center in Gray, to local beaches, and to the Portland Public Library, for a puppet show. Before the program wraps up, they'll be heading out to the Children's Museum and Theatre of Maine, and Fort Williams Park. And in Portland, public school starts on Tuesday, September 4. Celie Deagle and Lucia Helder contributed to this report. Originally published July 31, 2018, 2:18 p.m.